I have had problems with my male adult Yemen chameleon since I got him from private three to four months ago. He was almost starved to death and could not shoot his tongue and still can't. He was only able to pick up food directly with his jaws, which worked only with leaves and vegetables. The vet gave me a high-energy-food for hand-feeding and that really went well, it brought Joshi up to a good, healthy size and weight. 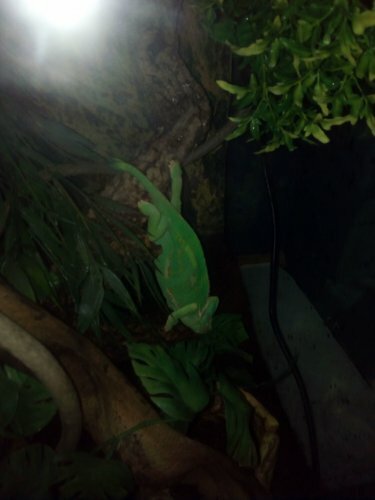 A couple of days ago I decided it would be the right time to start feeding him with "normal" chameleon food and I stuck some mealworms in his mouth, then a live Morio worm, then a live cricket, ... He always held them for a while and they were moving in his mouth, before he chewed and swallowed them. Next day, he could not open his mouth! He has been previously sometimes aggressive and attacked with his mouth wide open, which made it easy for me to shoot some paste into his mouth with a syringe. He also voluntarily used to open his mouth when he saw me coming with the water spray bottle - he likes having the water sprayed right into his mouth - or when I stroke him gently around his mouth with the water bottle. Now his jaws have been completely locked for two days and I had to force them open to insert the syringe with food and water, and even with force they will open only a little bit. He also occasionally holds his head up, bent back, and is swallowing outside of feeding time. What is happening here? Could the insects have injured him? Or is it a bone infection or something similarly serious? I will arrange a vet visit tomorrow, but I hope that you can already give me some answers here. I hope you know what you are doing when you shoot water in his mouth. You can easily shoot water into his lungs. It isn't "lockjaw". More likely that he's learned that you will try to force his jaw open and try to feed him, so he's resisting you. They have very strong jaw muscles for their size. If he does have some body weight built up at this point your bigger concern is hydration. I'd stop forcing anything on him and mist the enclosure around him with warm water. Let him try to drink on his own. If he's thirsty he will. Do not force water unless you know what you are doing. @Brodybreaux25 do you have that picture of where to put the water IF someone were do try this? Honestly I think a vet guidance may be what you need. Good eye on the clean frame, you must ride too? Were in south Louisiana so yea, deep mud and even deeper water everywhere. Bought that bike for my 6yo in September for $1300, really cheap... he was always begging to drive mine but as you can see it has just a bit too much power for him! Wow that's a great price. I used to ride but sold my Honda a few years ago. I have the itch to get back I to it but figure I'll wait till my son is a little older. Once he’s ready check out Tao Tao, they are a Chinese company and have tons of gas powered “trainer” bikes for kids, they start around $450. Thanks for the info. I'll look them up? Is that where you got his? Start your own thread, you’ll get much more help that way! No one on the internet can help your Cham, only an emergency vet can save her.